Take traditional Spanish Tapas dishes for a spin through the south with my Summer Southern Tapas Menu! This light tapas menu is full of Southern tapas, a twist on traditional Spanish tapas, for a light meal best enjoyed during the summer. Grab some friends and enjoy! 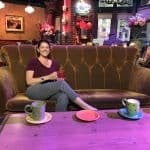 First, we need to go over tapas and what it is, where it is from, and what it means to eat tapas in the US. 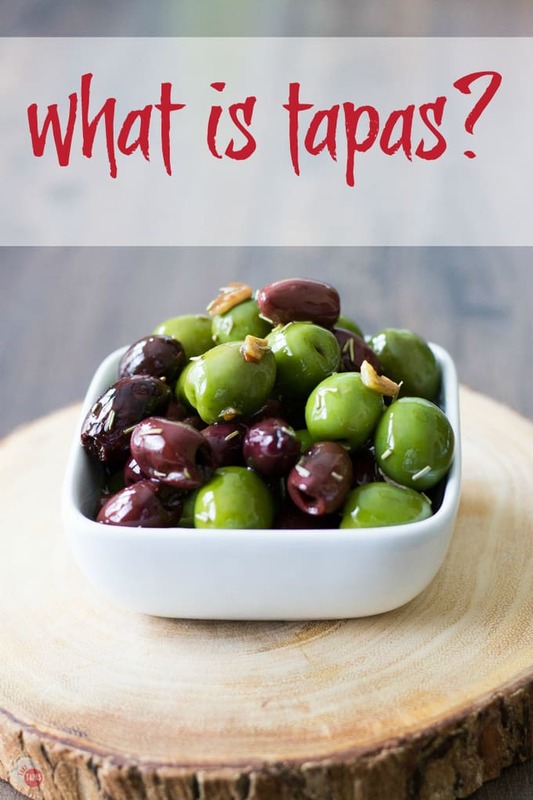 In this post, I discuss all these points and get you started on eating the “tapas” way. My family eats like this all the time and found that it helps us with portion control. 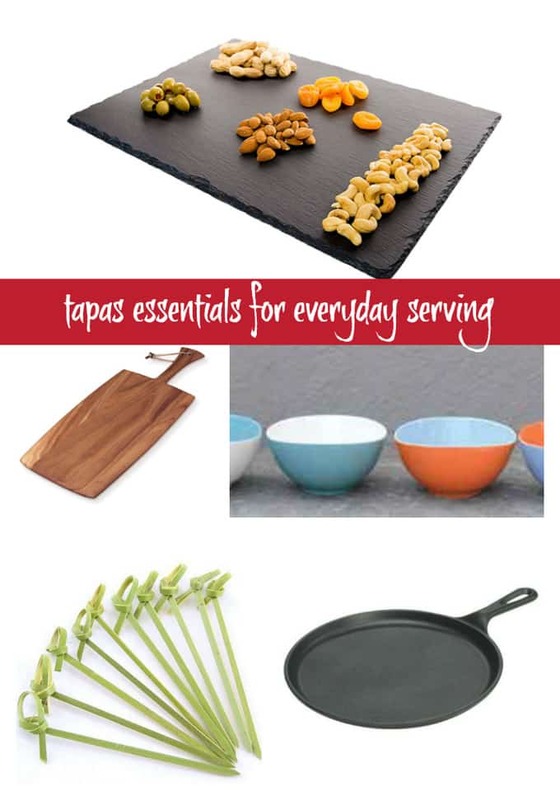 Next, we will talk about some essentials to have on hand when serving traditional or southern tapas and some other items I use to make serving small portion meals and grazing boards easier. Now, let’s get to the good stuff: The Menu! I love eating traditional Spanish Tapas but some of the ingredients can be hard to find. This came into play when I was living in South Georgia and couldn’t make the exact recipes for lack of specialty items. They might not be super hard to find in a big city, like Phoenix where I live now, but in small-town Waycross, you couldn’t even find Manchego cheese. This started me thinking that I can take the traditional recipes and add my own twist to them. I can add the popular ingredients found in South Georgia and turn them into tapas for everyone to enjoy! The individual southern tapas dishes have been slowly published over the past month, along with other recipes, but are you ready to get the whole menu in one place? We will start with the lighter dishes and then head to the heartier ones. The best way to start out a menu, in my opinion, is a cocktail. A great cocktail sets the stage for the whole southern tapas meal and can get you into the mood to celebrate or just simply enjoy the dining experience. 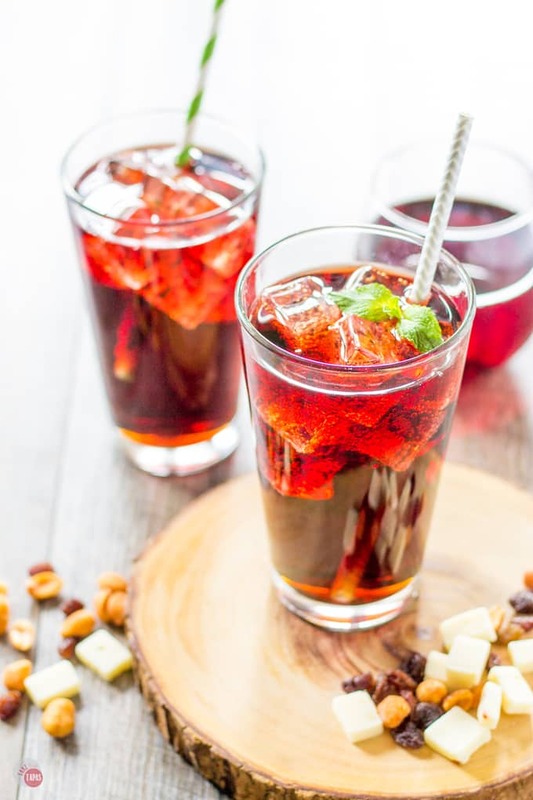 The Kalimotxo is a classic Spanish cocktail of wine and cola. Simple to make with only 2 ingredients! Simple to make with only 2 ingredients! After you get your drink on, let’s start with a simple rustic dish that is super simple to make. 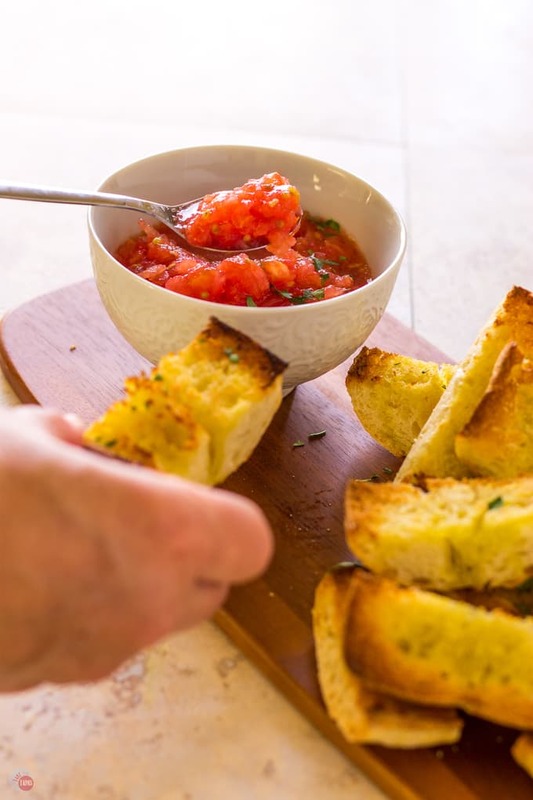 Pan Con Tomate is grilled or toasted bread, brushed with garlic, and served with a tomato “jam” or spread made with fresh tomatoes. I could eat this for lunch every day! Not totally southern tapas but why mess too much with perfection? If you are still just wanting to pick on something light, my Smoked Paprika Almonds toasted in bacon are a great snack! 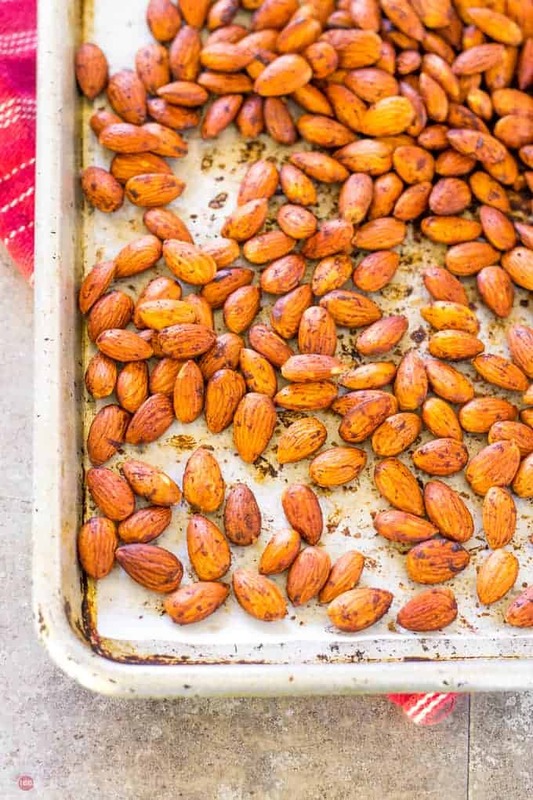 The almonds get a bacon flavor by tossing them in bacon fat (from the jar in my fridge) and toasting them in the oven until crispy. A dusting of salt and smoked paprika give them another layer of southern tapas flavor. Still not ready for the heavier dishes? 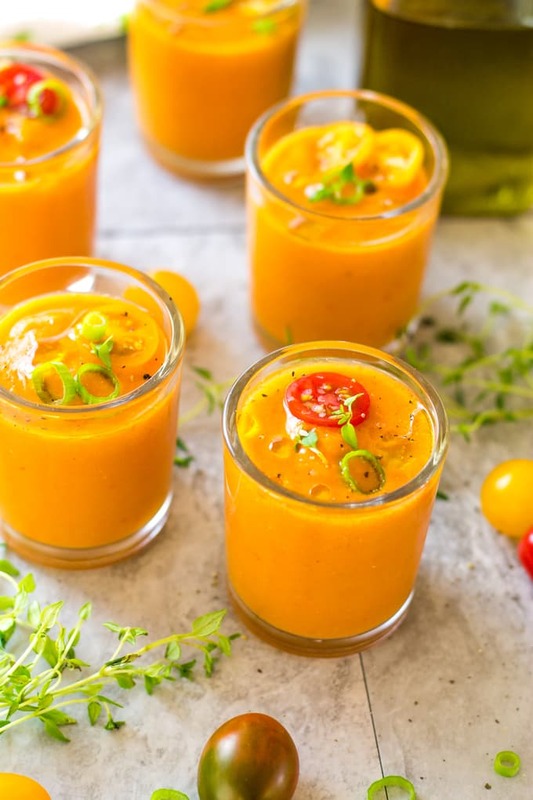 Go for a few shots of my Roasted Tomato Gazpacho. I roast some baby tomatoes from the farmers market with olive oil and fresh thyme for dinner and use the leftovers to make a chilled soup with fresh cucumbers and bell peppers. Now we can get to the heavier, but a little lighter than normal dishes, tapas items. 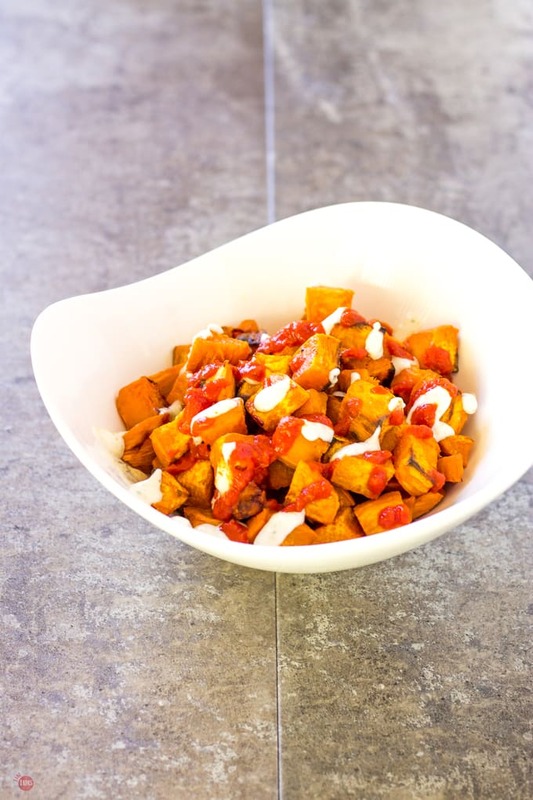 Patatas bravas is a classic dish of fried potatoes served with a smoky Bravas sauce and a garlic aioli. I prefer to bake them instead of frying and I use sweet potatoes instead. I serve my Sweet Potato Patatas Bravas with the traditional red sauce and a Ranch garlic aioli for a southern tapas bite. 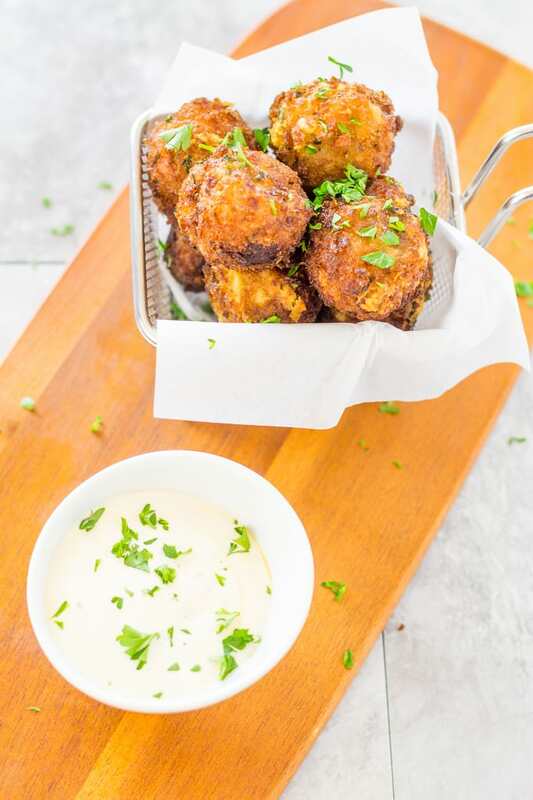 For a heartier bite and some bacon, whip up these Bacon Manchego Croquettes with Tabasco Ranch sauce. Ranch, bacon, and Tabasco scream southern tapas to me. The best thing about these tasty balls of goodness, besides the flavor, is that you can make them ahead of time and fry them up right before you serve them. Or fry and keep them warm in the oven while you are getting the other last minute details together. The final dish, and in my opinion the star of the menu, is the Pimento Cheese Tortilla Espanola. A traditional potato and egg omelet that is served either warm or room temp is spiced up with my creamy pimento cheese. This dish a little tricky and requires some arm muscles but once you get that omelet flipped in one piece you will feel so happy. And ready for another Kalimotxo! 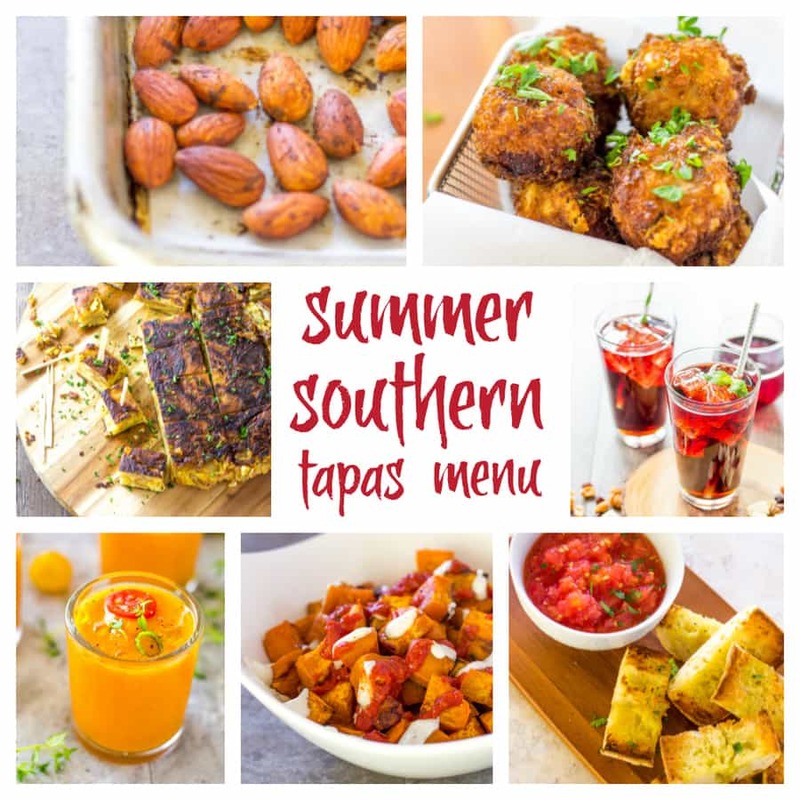 I hope this Southern Tapas Summer Menu gives you some inspiration for adding southern twists on traditional Spanish tapas. And a menu to celebrate the last few moments of summer before they are gone for awhile.